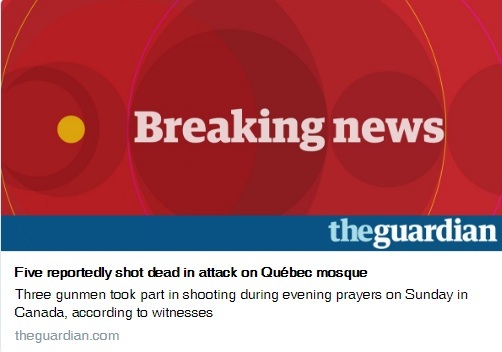 In an extremely sad news, gunmen have reportedly fired at a mosque in North America. The incident occurred in Quebec in Canada. Five persons have been feared dead in the attack. Two persons have been arrested for the shooting, reports said. The killings have taken place just after Donald Trump ordered ban on Muslims from several countries. It suggests that racists have got emboldened after the US elections. Later reports suggested that six persons were killed in the attack. News reports said that two suspects were held for the shootings. The killer was identified as Alexandre Bissonnette, a youth with far-right views. Now he has been charged with six murders. But will it be called Terrorism. Isn't it White Terrorism or Racist Terrorism or White supremacist Terror? 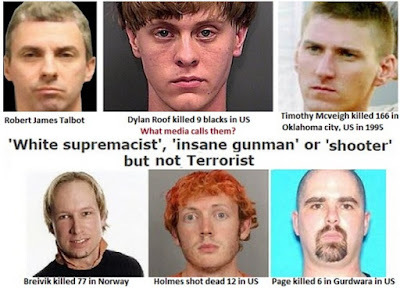 Till now, when a man even commits massacre in the West and is White, he is termed as either 'lone wolf', 'gunman', 'shooter' et al. Media never calls him terrorist. 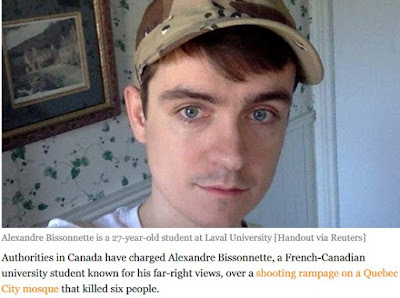 When identity is known--that the killer is White, even media reports say, 'his motive is not killer yet' though his racist or anti-Muslim views are known by then. Alexandre studied Political science and anthropology. He is a fan of French far-right leader Marine Le Pen, who is known for her anti-immigrant, anti-Muslim stand in France. On his Facebook page, he declared his admiration for her. Ironically, such a tragic incident --the firing at mosque, took place in adjoining Canada that has opened its gates to immigrants. 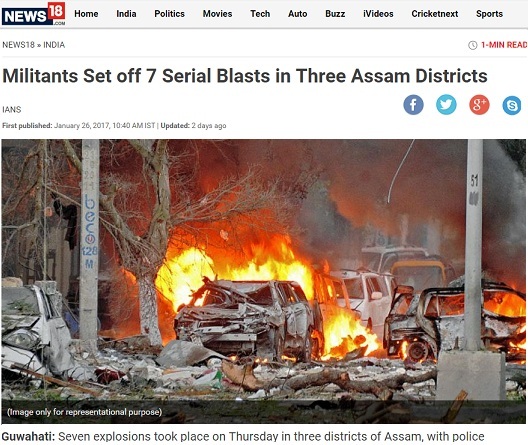 Serial blasts rocked Assam on Republic Day. The banned United Liberation Front of Assam (ULFA) is suspected to be behind the serial IED blasts. Besides, there were blasts in Manipur too. But did you hear about them? Did you read the news in papers? There is little chance because TV channels didn't find it newsy enough. National newspapers also ignored it. There were no front page reports. ULFA is a banned terror outfit. But when it is behind any explosion, its members are not called terrorists or even extremists. The blasts are not termed as 'terror acts' either. The blasts took plcae in Dibrugarh, Tinsukia, Charaideo in Assam almost simultaneously, reports News 18. CALL FOR BOYCOTT OF R-DAY! "Militant groups had called for a boycott of Republic Day celebrations in the northeastern region", the report further said. Some other papers reported the news but it didn't become a 'breaking news' at all. Doesn't it indicate failure of BJP-led government in Assam? Were there any questions raised on law-and-order situation in North Eastern state! Any panel discussions on why situation fails to improve in Assam. Times of India reported that, "A group of school children going for the Republic Day celebration at Dibrugarh had a miraculous escape when a bomb planted under a culvert exploded in front of them". "In Manipur, the first explosion took place adjacent to the compound wall of a government college close to an Assam Rifles camp at Singjamei area in Imphal West. Another bomb went off near a CRPF camp at Mantripukhri a few minutes later", it further wrote. SO MANY BANNED OUTFITS IN NORTH EAST CONTINUE TO OPERATE! "At least seven militant outfits under the conglomerate of United National Liberation Front of Western South East Asia (UNLFW) including Ulfa (I), NSCN (K) and Corcom of Manipur had called for a boycott the Republic Day celebration in the region", reported Times of India. "Manipur Governor Najma Heptula unfurled the tri colour amid tight security arrangements at the historic Kangla fort. In Assam, the banned anti-talk Ulfa-I exploded seven low intensity bombs at four places to mark their protest on Republic Day", the paper further wrote. This photograph was taken at Madarsa Riyazul Uloom in Indore. During the Republic Day function, national flag was hoisted. 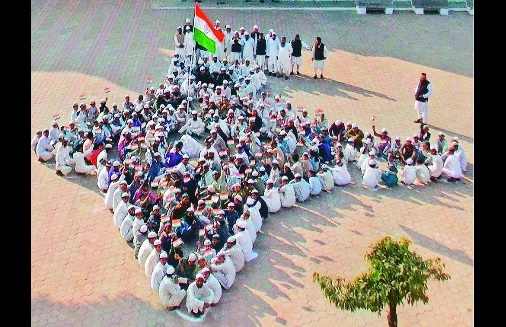 The students formed a map of India. The photograph was published in many newspapers in Indore, Western MP. The madarsa is located in Khajrana in Indore. 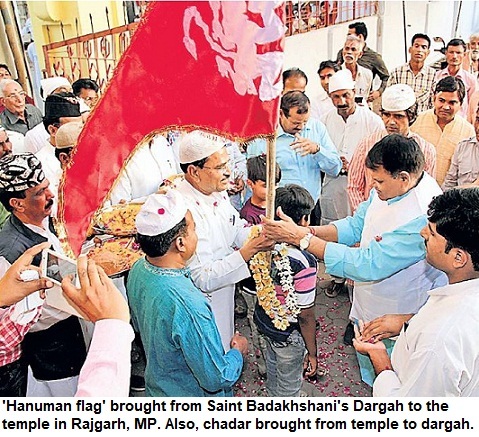 This particular photo was published on the front page of Prabhat Kiran. A Muslim religious leader read out Quranic verses, giving a clear message to US President Donald Trump. 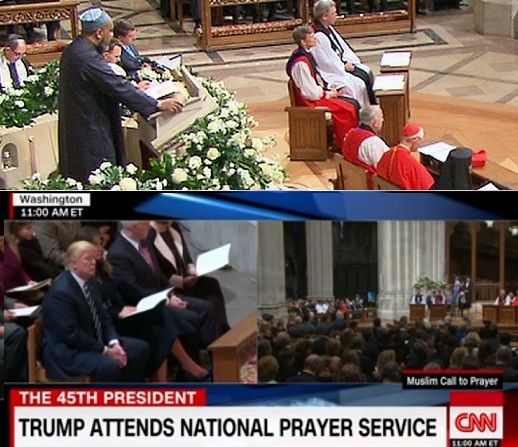 Imam Mohamed Magid was among the 26 religious leaders representing different faiths who were to participate in the service, which is a tradition from the times of George Washington. Magid was expected to recite Azan but he chose to read out from the holy Quran. The message was loud and clear. You have to respect the differences in colour, race and religion. ..the imam chose two passages from the Quran with clear political implications, especially at a time of racial and religious strife, when many American Muslims feel marginalized and mistrusted", mentions CNN. The second verse he read was from Surah Ar-Rum: And among the signs of God is the creation of heaven and earth, and the variation in your languages and your colors. Verily, in that are signs for those who know." A spokesman for Magid said his recitation of the verses had been approved by officials at the Washington National Cathedral. "After the election, when a lot of things were said about Muslims, and there were questions about Muslims' loyalty, these verses were intended to convey the message that we must come together and respect diversity -- that God made us this way," said Rizwan Jaka, board chairman at the All Dulles Area Muslim Society. 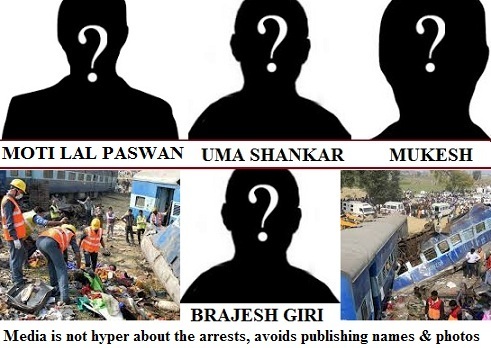 150 killed in Indore-Patna Express train disaster were victims of terrorism: Who are these terrorists? As many as 150 persons who were killed in Indore-Patna Express train tragedy were victims of a terror attack, say investigative agencies. A bomb was planted on the track and the blast had caused derailment and the large-scale devastation--deaths of innocent passengers. The blast was engineered by Motilal Paswan and two others--Uma Shankar and Mukesh who had planed the Improvised Explosive Device (IED), causing the fault in the tracks, reports NDTV [LINK]. They had also targeted another train but couldn't derail it, say reports. Superintendent of Police (SP), East Champaran, Jitendra Rana, is quoted in media reports about the disclosure and the suspicion that Pakistan's ISI was involved in it and money was paid through a Gulf-based Dubai resident. After the disclosure--such a sensational news by any standards, newspapers carried the report without focusing on names. Headlines talked about ISI but not about perpetrators. Start reading this report [LINK] and while there is kite-flying, you read paragraphs after paragraphs, but names of those arrested won't be found at all. So someone who paid the money from foreign country is immediately seen as villain because the new story is accepted but the names of the perpetrators who executed it on ground are being hidden or attempts are made to put names at the end of the reports. Of course, no attempts to publish photos even next day or in follow-up stories. In fact, story was out of front page after the first day. Unlike other cases when media publishes photographs of 'darinde' or 'hatyare', everyone remained soft and no attempt was made to publish information about Moti, Uma Shankar, Mukesh or even handler Brajesh Giri. In this HT report, [LINK], where are the names, after how many paras? In several Hindi papers, front page story didn't carry these names, at all. In some, these names were at the 10th or 12 page in continuation of the story. So why this sympathy for suspected terrorists? In a disaster of such magnitude, newspapers are reluctant to publish names of those who engineered and executed it! Doesn't it tell the sad state of journalism in India! Unless there is a Muslim name, it can't be sensational. Hence, forget words like 'terrorist' or terror suspect, the references are 'three persons', 'these men' et al. That's how our media reports Terror. Else, even those who are not linked to any violence, and just suspected of association with a banned outfit are immediately defamed and for days their photographs are published. Donald Trump has finally taken over as 45th president of United States of America. Trump's campaign, the comments targeting immigrants, Hispanics and Muslims apart from the blatant Islamophobia during speeches, have surely caused concern across the world. There are at least 3 million Muslims in America. 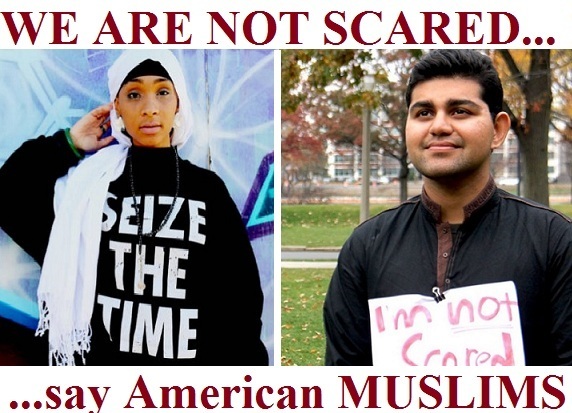 Many American Muslims say that they are apprehensive but not scared. Take for example, these youngsters who say that they have nothing to fear. They are optimistic and ready to fight Islamophobia. They are proud US citizens who want peace and goodwill among communities. The positive aspect is that they have faith in American democracy, its society, constitution and laws. And, surprise, some may be happy with Trump's victory as a Yemeni American is quoted below. Alia Sharrief, an Oakland rapper is not afraid. "I feel like the best way to beat a bully is to stand up to a bully and show him you ain’t gon’ take it,” she says. Rashid is an international relations major at the Frederick S. Pardee School of Global Studies. Pinned loosely to his tunic is a handmade cardboard sign that says, “I’m not scared...". In fact, he wants to go and work, after graduation, with govt in future. Wow, that's the spirit. "I’m not scared of the future. I have a lot of hope and optimism in this country", he further says. Though there are definitely signs of anxiety, Muslims say that they are not going to get bullied. "We can’t be intimidated. "We are part of this country and we will do everything we can to battle for its heart and soul, which after this election America seems perilously close to losing", he writes in The Guardian. "We are not discussing flight, we need to fight". Facebook blocking users for social, political posts in India: Is it right-wing groups' mass reporting or FB India's bias? Facebook is blocking users for posts that neither incite hatred, nor put up any objectionable content. Users are blocked for days, at times even for a month. Mostly, users who are popular and have huge following are being warned or blocked. Those who are facing it on a regular basis, write in Hindi, and mostly comment on social-political issues. Firstly, most of them are critical of political parties and write against Fascism and right-wing extremism. Some of them are critical of BJP and its policies. Secondly, those who have huge following on Facebook and are in a position to spread the message far and wide, are being targeted. This is being done by 'reporting'. Apparently, you 'mass report' an account. When many people report, the Facebook India officials perhaps close their eyes and simply act, without checking whether the user has violated any guidelines or not. Senior journalist Dilip Mandal has written that it seems Bahujan and Muslim writers are being targeted. 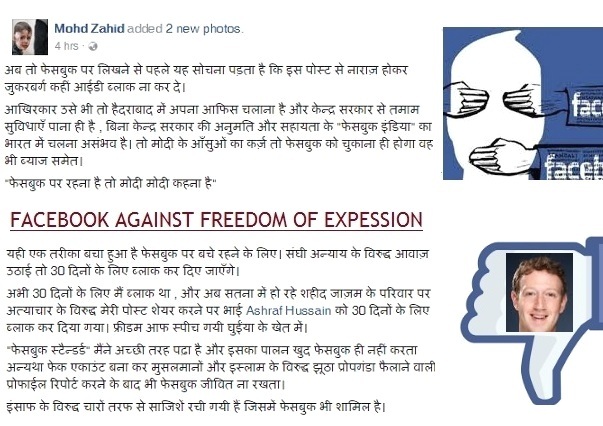 "Mostly Muslims, writers who are anti-caste are targeted....posts critical of government are also removed", he writes. "Facebook India is a corporate body and it is understandable those who have more influence in Indian society, would also be among the decision makers in FB. It is a test of Facebook's credibility. Let's see if it passes it. Everyone knows that Lohri is celebrated in winter. The festival is associated with Dulla Bhatti. There are songs praising the 'son of Punjab', which are sung on this occasion. But who was Dulla Bhatti? How many remember him? Abdullah Khan Bhatti, a Muslim Rajput, had become a hero in Punjab during the reign of Akbar. A historical and real life character, Bhatti's name is part of Punjabi folklore. Bhatti grew up along with Prince Salim. Bhatti had later rebelled against the Emperor. He was known for saving young girls and protecting their honour apart from his generosity. Though he also belonged to feudal class, he rebelled and fought against the powerful and sided with the poor. Bhatti arranged girls' weddings and also gave dowry to them. The famous song 'Sunder mundriye ho!' [See song and its translation: LINK] recalls his heroic acts, especially, the story of how he saved a girl and got her married to a Hindu boy. Though there was no priest around and he didn't know the Hindu rituals, he lit the sacred fire. As he took on the might of the Empire and helped the poor, his acts of valour and his vow to save the 'Punjabi honour' made him a legendary character. Hence, modern writers often equate him with Robinhood. Punjabis say that terming him Robinhood is belittling him, as he rebelled on one of the biggest and most powerful empires, stood for women's honour and fought for a long period. Bhatti was finally arrested and executed. Sufi Shah Husain's famous words about Bhatti are part of folklore. The Sufi saint said, "No son of Punjab would ever sell the honour of the land". 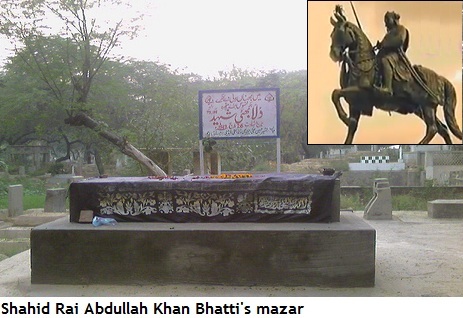 Dulla Bhatti's grave is located in Lahore, Pakistan. Free media is important, everyone acknowledges. But it's difficult to be 'free' as setting up and running a media house requires moolah. And, there is no surety of returns. In India, there is constant debate over fairness of media, lately. Questions are raised on credibility of TV channels [and newspapers] who now a days take sides openly--either due to the ideological slant of the owners, their interests or because of funding source. The voice of the poor and marginalised sections is heard less as 'big media' mostly focuses on issues that bring 'eyeballs', not 'serious or depressing' stories. Rural India, backward groups, minorities and many other sections of the society are not adequately reflected in reporting. If in the year 2017, we are still talking about media not focusing on entire sections of the society, it can be imagined what was the situation a decade ago. Just think about it, when there were no 'Catch' or 'Scroll', no 'FirstPost' or Quint. Besides, there was no social media proliferation, then. Today, anyone can write a Facebook post that goes viral or puts his own video on YouTube or use WhatsApp to broadcast certain content and make it go viral. Today, portals give space to news and also to views. But there was a period when newspapers even ignored letters to editors. There was no way to put your voice across, if papers or channels were not willing to air it. Does everyone remember the times though it is no too long ago. For Muslim issues, there were just Urdu papers or few blogs. Sometime even politicians were wary of taking up cause of the victims--such was the situation. TwoCircles.net's role has been significant and needs to be recognised. I remember very well, how, issues concerning highhandedness of police or atrocities on weaker sections that were not carried by mainstream papers, came to public domain due to the portal. That it appointed reporters in different cities and made them chase stories, focus on stories neglected by mainstream media and did series of special stories on important issues, is something that is really significant. Over the years, I remember the news website doing excellent journalism. In the later part of the first decade [2006-2010], there were innumerable cases of Muslims arrested on false charges and their lives were ruined. The police version was believed immediately after arrests and no questions were asked. Once in a while, an Indian Express would do a story, abut for most of the time, there was silence. No effort was made or interest shown to bring to us the voice of the other side. Many stories were suppressed as no one was willing to do them. TCN's biggest achievement is that it broke this unwritten media code. Its series on torture of youths implicated in UAPA in Madhya Pradesh or indiscriminate arrests of Muslim youths in Uttar Pradesh, brought the plight of victims and police excesses to national media. Also, it was not in complaining mode all the time, as it happens when media that focuses on minorities. Positive stories and success stories were carried on the website. It exposed politicians and mainstream media was forced to take notice. I have never met any of the team members behind Twocircles.net, except, two reporters who worked for it. But I have been following it since its beginning. Personally, as a journalist and as a reader, I feel that the website has made an outstanding contribution. 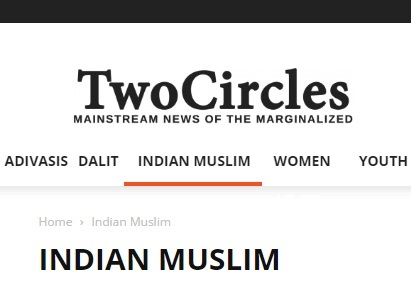 It was after TCN, that many other 'Muslim-centric' sites came up. Meanwhile, TCN has grown too. Now it is bilingual and more diverse. It covers social issues apart from focusing on tribals, dalits, other weaker sections. Of course, it covers politics and comes up with analyses too. Some of the reporters who worked for TCN in the past, are now well-known journalists and writers. And yes, another point. Urdu newspapers [or even some English periodicals-weeklies] run by Muslims were excessively Muslim-centric and their reporting was reduced to covering Waqf Board or Urdu Academy, Muslim politics and issues concerning just Muslims. This hurt the journalists working in these groups, as they couldn't expand their horizons. Over the years, many of these reporters thought journalism was just about the particular beat or interacting with politicians. TCN went much beyond that and its reporters broke stories, which is essential for any journalist. Further, the stories had impact. One has to work hard on the ground, get information, dig through reports, cultivate sources in order to get exclusives. Many TCN reports came up with interesting and insightful stories. Generally, we recall work of people in the distant past and ignore the hard work that is going on around us. I wanted to write this post for a long time. TCN team's efforts must be recognised and appreciated. I feel credit is due to Twocircles.net for its role as an independent media organisation. It has played a major role as an institution of non-profit journalism. Thank you Kashif sahab. The team that runs it and those who support it, deserve a salute. Meryl Streep's strong speech* at the Golden Globe awards has come as a shocker in India, where Bollywood celebrities refuse to take stand. The stars avoid speaking up and it is almost impossible to imagine a Bollywood star daring to speak critically about any powerful politician. Over the years, Bollywood stars have shed the 'secular' pretence. Many of them generally support the ruling party, even going to the extent of being labelled as sycophants and bhakts. Taking stand is something that is unheard in Indian film industry. A few dared to speak up but were bullied into silence or their movies targeted through different ways--threat of violence, boycott call or intimidatory tactics. No wonder, Bollywood celebs are seen as spineless. The great 'Big B' or Amitabh Bachchan is known for not taking stand. He even capitulated before MNS' Raj Thackeray. Clearly, Meryl Streep's speech has come as a wake-up call. 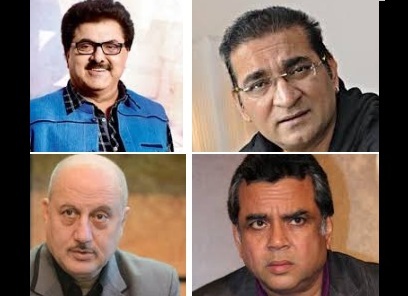 Twitterati asked when Indian movie stars would dare to speak up or take bold stand. Streep had criticized President-elect Donald Trump. On the other hand, in India, many film stars sense opportunity to cosy up with the politicians, irrespective, just to gain 'power'. Right now the race is on to become 'bhakt'. At the Golden Globe Awards, 2017, she criticised Trump and urged other artists to take stand on issues. What's in a name? Everything is the name now. A man began shooting indiscriminately at an airport in Florida in United States of America. The wire reports, tweets suddenly started appearing on smartphones. Soon it became clear that five persons had been killed and many more wounded. Till now, there was panic and everyone was worried what it might turn out to be. Mercifully, the killer was arrested soon. He was taken into custody. The person's identity was also known. 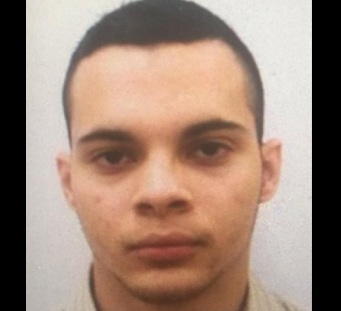 The name was Esteban Santiago. The person is an Army veteran. Immediately, it was known [that it was understood know] that this was not a 'terror attack'! Strange, isn't it. Yes, that's how the world, the international media functions in this era. Santiago was described as 'gunman', 'shooter' or just 'suspect'. The reports were set to be diluted and headlines no longer sensational. It was termed 'the incident at Fort Lauderdale-Hollywood International Airport in Florida'. One headline said, '5 dead, 8 wounded in Florida airport shooting; U.S. vet arrested'. The other read, 'Fort Lauderdale shooting: five dead as suspect identified as Iraq veteran'. Clearly, no alarm was needed, anymore. It is always like that, isn't it? The man is called 'Lone wolf' or 'shooter' or 'gunman' because the person is not Muslim. There is an 'understanding', a code which is unwritten but observed all over the media world--everyone knows what words to be used to describe after religious identity is known. The follow-up reports started coming fast. NYT got this report, within hours, 'Florida Airport Assailant May Have Heard Voices Urging Violence, Officials Say'. Of course, he must be 'insane'. No talk about his links or modules or connections or motive. 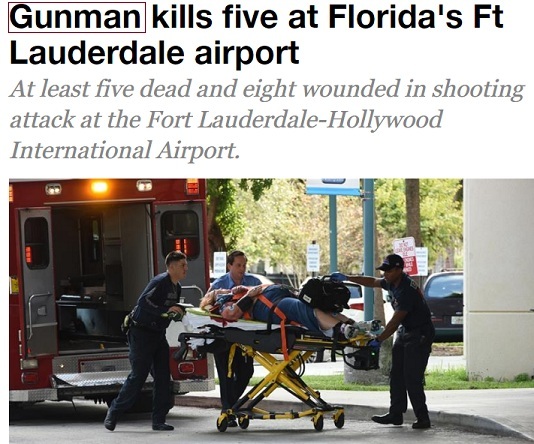 Other reports included Al-Jazeera that gave the headline, ;Gunman kills five at Florida's Ft Lauderdale airport'. Leading newspaper Guardian reported, 'Fort Lauderdale shooting: five dead as suspect identified as Iraq veteran'. Do check the reports to understand the double standards on terror and reporting such shootings. Isn't time that media organisations take a serious note of these double standards, introspect and go by the book--ethics, rules and norms of journalism! Irresponsible and biased journalism affects opinion of millions, turns people against entire race and religion, spreads poison in society. Intention or association with any group could be known only after probe but what happens is that NAME is enough to decide what words would be used to describe him and how much sensationalism, coverage would be given to the event. Hence, it is dire need of the hour that same vocabulary should be used for the same crime or extremist act. If a person is Muslim, Christian, Hindu or Jew, his religion must not be criterion for his criminal nomenclature. Uttar Pradesh, the most populous state in India, is going to polls. The state with a population of nearly 200 million, has the largest Muslim population in the country. On Wednesday, as poll schedule was announced, a post about the fact that Muslim candidates can't contest all the seats in UP, was being shared widely on social media. It mentioned that soon after independence, the discrimination began. So Muslims will vote in each constituency but they can't contest in each of them. Why? It is because Muslim Dalits and Muslim Tribals are denied reservation. As a result, the seats reserved for Dalits, can't have Muslim contestants. This is because of a Presidential ordinance. And, it is true for most other states too--on seats reserved for SCs and most seats reserved for STs too (with some exceptions). First, Tariq Anwar Champarni, wrote a post on Facebook, in the morning. He mentions, ""India is a secular state where there can't be any discrimination on the basis of religion...but see the other aspect...of all the 4,120 Assembly seats in India across different states and union territories, Muslims can't fight nearly 1161 seats (28%)". Champarni writes that depriving a community from contesting polls on so many seats, leads to injustice from the beginning. 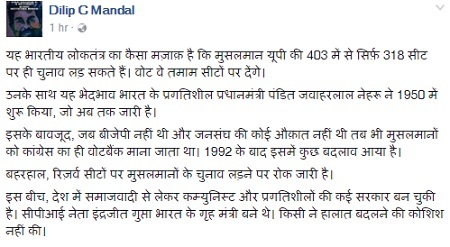 Hindus can fight all the 4,120 seats and Muslims can contest just 1161 seats. 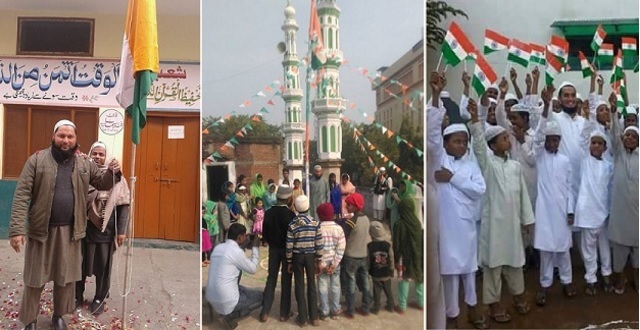 "If you are really secular, just, then you must fight to ensure that the backward-weaker sections among Muslims, get the right to contest election these seats", Champarni further wrote in this post. Some other writers also expressed similar opinions. Author, journalist Dilip C Mandal also mentioned the fact. 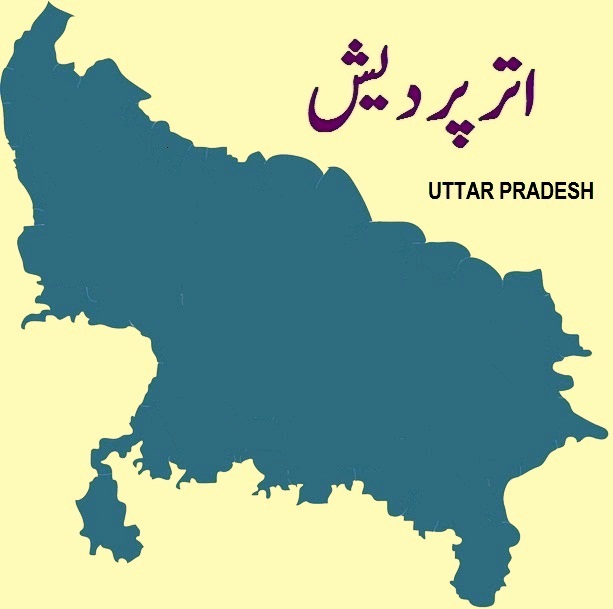 "It is a joke of Indian democracy that Muslim candidates can contest just 318 out of 403 seats in UP though they will vote on each seat...."
It is also a fact that often Muslim majority seats are kept reserved. With Muslim representation already low, it hurts the community further, feel observers. The brutal lathi-charge on Aligarh Muslim University (AMU) students has angered Muslim youth in Uttar Pradesh. The students had organised a protest over disappearance of Najeeb Ahmed, the JNU student who has been missing for months and is yet to be traced. However, the police thrashed the protesters. It has led to strong reaction among Muslim youth in the poll-bound state. 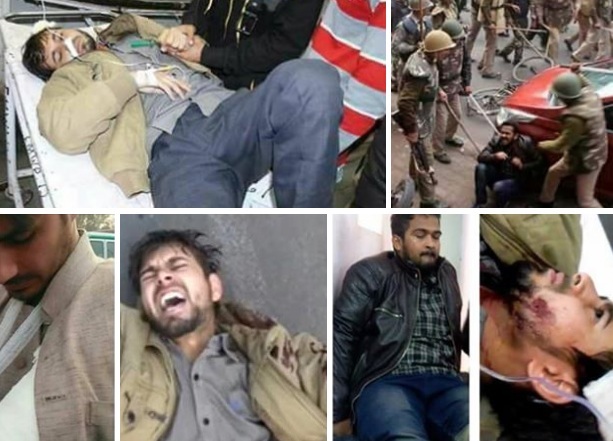 For the last two days, photographs of injured students has been going viral on internet and are being shared by WhatsApp. This has further irked the Muslims. Youths feel that such brutal cane-charge on students during the Samajwadi Party (SP) regime shows its attitude towards the Muslims--the community is taken for granted. While Akhilesh Yadav is busy taking reins of the party from his father, there is a strong undercurrent among Muslim youths over the issue. Will it have an impact on poll prospects of the party when elections are drawing nearer! This cant' be ruled out. The general question is that why students were treated so brutally. And, why district administration acted with such vengeance. Further, no action was taken against the officials. Instead, youths were later booked for the protest. The feeling that under SP government, Muslims can't even raise voice, is getting stronger. Also, the Muzffarnagar riots haven't been forgotten. People remember how Akhilesh Yadav government had failed to act when nearly scores were killed and tens of thousands got displaced. The feeling that SP considers Muslims as 'loyal votebank' who have no option, has gained ground. But, the reality is that Muslims are in no mood to be treated as vote banks. The result of the fight over 'cycle'--the SP symbol, would be known in a few days. After that, Muslims would take a decision. In many constituencies, the decision would be taken on the basis of local candidates' strength. The entry of AIMIM has also changed the scenario. MIM's leaders and its party workers' constant criticism of SP government, has dented the image of Akhilesh Yadav. MIM may not get a chunk of votes but its arrival has changed the manner in which Muslim electoate looked at SP. The year 2016 is over, finally. It was the year when cow vigilantes' terror continued. 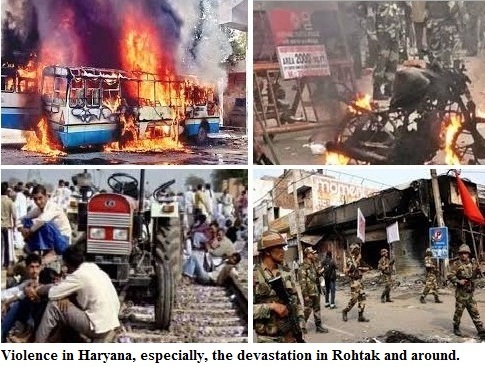 Apart from Muslims, Dalits and other backward communities also became the target. There was Una incident which led to the birth of a new movement in Gujarat. Rohith Vemula was harassed and his death led to a nationwide outrage. In institutions, students were targeted because of their caste, religion or appearance. Most of these incidents were reported on this website. Here is a list of the incidents that took place during the course of the year. *JNU row [sedition cases filed against students and their arrest] was another major incident. Campuses remained on the boil through out the year. *Extremism in the name of cow spread across the country. From Himachal Pradesh to J-K, Jharkhand to MP, the cow vigilantes acted with impunity. *The photograph of missing student Najeeb's mother seeking justice while being targeted by policemen, marked another low for the State and the law-enforcers. Najeeb is yet to be traced. *The political events and demonetization [which affected nearly a billion Indians] are well-known. The encounter after the suspicious jailbreak in Bhopal was another major incident. MP government was in no mood to order a probe. There were questions raised on the encounter. The incident got international attention. Also, it was the year when media became the news. Either it was because of channels who decided that they would aid in propaganda and become a tool in the hands of politicians or because of efforts to harass journalists--something that kept happening throughout the year. Goodbye and Get lost 2016. We can only hope that 2017 would be a better year.